Josh Rourke (22): Victoria Road, Platt Bridge - Used threatening, abusive or insulting words or behaviour towards April Martin: Community order for 12 months with rehabilitation activity requirement, unpaid work requirement for 72 hours, restraining order not to enter the Brick Project, Arcade Street, Wigan, pay £50 compensation, pay a surcharge to fund victim services of £85, pay costs of £65 to the Crown Prosecution Service. Callum Benjamin Clayton (18): Hollington Way, Wigan - Used threatening, abusive or insulting words or behaviour with intent to provoke a fear of violence: Fined £186, pay a surcharge to fund victim services of £30, pay costs of £85 to the Crown Prosecution Service. Neil Philip Blower (52): Pepper Lane, Standish - Without reasonable excuse used a device capable of storing digital images while prohibited from doing so by a sexual harm prevention order, possession of a device (an Xbox 360) capable of accessing the internet: Jailed for four months suspended for 24 months, rehabilitation activity requirement, pay a surcharge to fund victim services of £115, pay costs of £85 to the Crown Prosecution Service. Martin Taylor (39): Scholes, Wigan - Failed to comply with supervision requirements following a release from prison: Jailed for 14 days. Christopher Hayes (32): Wigan Lower Road, Standish Lower Ground - Assaulting an emergency worker by beating him, damaged a police radio, assaulted Leah Wilson by beating: Community order with 12-week curfew, pay total of £175 compensation, pay a surcharge to fund victim services of £85, pay costs of £85 to the Crown Prosecution Service. Carl David Smith (21): Robin Hill Drive, Standish - Drink driving in a BMW on Woodhouse Lane, Wigan, with 58 microgrammes of alcohol in 100 millilitres of breath: Fined £200, pay a surcharge to fund victim services of £30, pay costs of £85, disqualified from driving for 16 months. 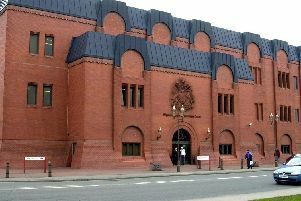 Neil Christopher Masters (33): The Brick, Wigan - Harassment of Kristian Hilton, entered as a trespasser at Summat to Ate in Hindley and stole alcohol: Committed to prison for four months, pay a surcharge to fund victim services of £120. Marc Richard Moore (33): Lamberhead Road, Norley Hall - Stole a bag with contents belonging to Sarah Boydell and used her stolen credit card: Community order for 12 months with drug rehabilitation requirement and 100 hours of unpaid work, pay £803 compensation. Richard Arthur Overy (67): No fixed address - Assaulted Margaret Smith by beating her: Community order for 12 months with alcohol treatment requirement and 90 hours of unpaid work, pay £150 compensation, pay a surcharge to fund victim services of £85, pay costs of £300 to the Crown Prosecution Service. Macauley Worth (23): HMP Leeds - At Wigan, assaulted Nathan Jones by beating him: Jailed for 46 days with the offence being so serious as an assault on a prison officer whilst serving a sentence for violence, pay £100 compensation, pay a surcharge to fund victim services of £85, pay costs of £115 to the Crown Prosecution Service. Daniel Melling (32): Heyford Road, Wigan - Entered as a trespasser at The Cutting Corner, Bell Lane, Wigan, and stole various items worth a total value of £1,500: Pay £1,100 compensation, community order for 12 months and be under curfew for eight weeks. Carl Reardon (51): Harrowby Street, Newtown - Stole a gold necklace worth £586 belonging to Uncle’s Jewellers and Pawnbrokers: Community order for 12 months with drug rehabilitation order, fined £60, pay a surcharge to fund victim services of £85.